Come and join us for March of the Mermaids from 11am on July 23rd at Hove Seafront. We have teamed up with Whalefest to celebrate the wonderful creatures in our Oceans. We will be helping them raise funds for the World Cetacean Alliance. 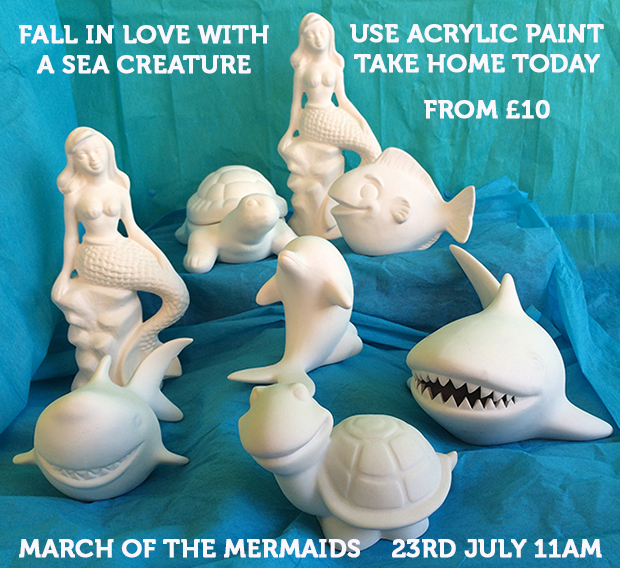 There will be plenty of beautiful creatures to paint and take home. John Ives who painted our Whale Mural will also be with us. There will be lots of opportunities to win some great prizes. Please keep another date in your diaries - 20th August at the shop. John will be exhibiting his work in August and on the 20th August will be refreshing his mural and talking about his Whale Adventures and the work that he does to try to raise awareness of their plight.